Pioneering early-70's Spanish progressive band, GRANADA (from Madrid...) was the musical project of multi-instrumentalist Carlos Carcamo (flute, violin, acoustic - and electric piano, mellotron, clavicordio, 12-string guitar, percussion and vocals!) and the other musicians Michael Vortreflich (electric guitar), Antonio Garcia Oteyza (bass) and Juan Bona (drums and vocals). GRANADA had a unique style. They remind of the Mexicans ICONOCLASTA, and also other Spanish bands like TRIANA or COTO EN PEL. The British influences come from YES, JETHRO TULL and other Italian bands very present in their sound. The emphasis of GRANADA relies on the keyboards (with profusion of moog and mellotron) and guitar instrumental passages, but with more keys that guitar. They sound like a mix of fusion and symphonic influences. 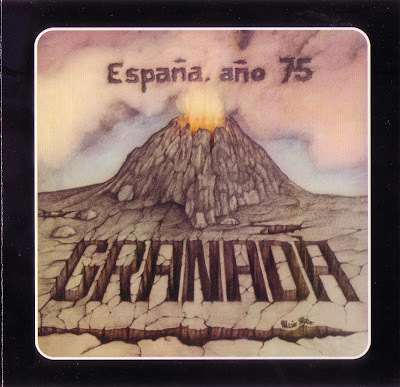 GRANADA released three albums: "Hablo De Una Tierra" (’75), "Espana Ano" ’75 (’76) and "Valle De Pas" (’78). The debut-album "Hablo De Una Tierra" is their most original album. The six compositions sound very varied (from rock and bluesy to latin and symphonic) with strong Spanish vocals, powerful guitar (some biting solos), pleasant keyboards (many beautiful Mellotron waves) and IAN ANDERSON inspired fluteplay. The title track includes a splendid and very unique duet from the Mellotron and flamenco guitar of guest-musician Manolo Sanlucar, goose bumps! Two of their best albums "Espana Ano 75" and "Valle Del Pas" were reissued on 1 CD. They consist of instrumental, melodic progressive rock with occasionally surprising moments, which include the use of orchestration and bagpipes. They are both two excellent examples of Spanish prog and highly recommended. Definitely check them out!! !